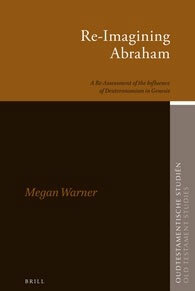 In Re-Imagining Abraham: A Re-Assessment of the Influence of Deuteronomism in Genesis Megan Warner revisits the tradition that Genesis was edited by editors sympathetic to the theology of the Deuteronomist. On the basis of close, contextual readings of the four passages most commonly attributed to (semi-)Deuteronomistic hands, Warner argues that editorial use of Deuteronomistic language and themes points not to a sympathy with Deuteronomistic theology but rather to a sustained project to review and even subvert that theology. Warner’s ‘re-imagining’ of Abraham demonstrates how Israel’s forebear was ‘re-imagined’ in the post-exilic context for the purpose of offering the returning exiles a way forward at a time when all the old certainties, and even continued relationship with Yahweh, seemed lost.